in Search Marketing, Social Media with tags Comments, google+, Video, YouTube Both comments and trackbacks are closed. Still skeptical about whether or not Google+ is relevant for your brand? Some recent news from YouTube may have you thinking differently. In YouTube’s latest update, users will now be required to have a Google+ account in order to comment on videos. More than just improving the quality of YouTube comments, this move hints at Google’s bigger desire to more deeply integrate Google+ within its other properties. Over the past several months, Google has steadily been putting Google+ at the center of its search and video products— and is likely to continue in this trend for all of its properties. For that reason, marketers should view Google+ as a common thread linking each of these components, rather than an aggregate “community” of +1s. According to Google, four out of five people who use comments have already synced their YouTube accounts with Google+ – so for most users, the change will not be a drastic one. Still, the update has some detractors (from Reddit users toYouTube’s cofounder) pointing out how the new functionality is a convenient way to require more people to use Google+. In order to start commenting and using YouTube’s other new features, users will need to connect their YouTube channels to a Google+ identity. Note: Commenters will have the option to select which name they would like to have posted with their comment:either their Google+ or YouTube username. Instead of seeing the latest comments in the comments feed, users will now see comments from people in their Google+ Circles, creators and popular personalities which will now rank higher in the feed. Note: Users will still be able to sort by newest comments, but this will no longer be the default setting. Now, when users comment on a YouTube video from a Google+ page, the comment will automatically appear under the YouTube video through that users Google+ account. 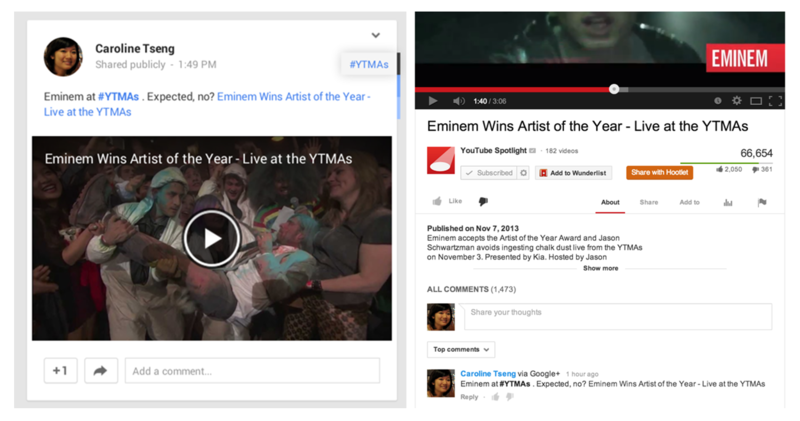 Commenting on the YouTube platform, however, provides an opt-in check box for posting to Google+. Above: A video comment first shared via Google+ now appears in the comments thread of the video’s YouTube URL. Choose who can see it: Specific people? A certain Google+ circle? Users can now choose how public (or private) they would like their comment to be. Add URLs + Rich Text: If a user poses a question, other commenters or the video creators themselves can now better direct them to an offsite URL. Additionally, users can now add style to their comments with special tags (i.e. _italics_ → italics; -strikethrough- → strikethrough). No more interaction with old comments: Old comments will still appear in the comments feed, but will now become static and users will no longer be able to reply to or rate them. Add people to the discussion: Similar to the tagging functionality found on almost all social networks from Facebook to Vine, users can now use the “+” or “@” to send a notification to someone in their Google+ Circles, letting them know that they’ve been mentioned in the comment. Initially, we have seen a slight backlash and negative perception of Google+ and YouTube from the platform’s passionate community — but we expect the eventual result to be a greater sense of community amongst users on YouTube and Google+. The overall effect for users will be greater restraint, as profiles will be more strongly linked to their online identities through Google+. Accountability, though, will likely lead to more quality, thoughtful comments. Anticipate a spike in activity on Google+. By requiring the Google+ connection for a user to comment on YouTube (with its one billion uniques/mo), there will likely be an increase in users and active engagement on Google+ for brands. This means more signed-in Google searchers leading to more personalized search results from “circles.” In addition, there may be an increase in search activity within the Google+ platform. Understand the increase in YouTube video views. A larger audience on Google+ means a larger audience for a brand’s YouTube channel. As YouTube users connect their accounts with Google+ and engage with YouTube content, their activity has the potential to be seen by users in their Google+ circles as well. Increased Engagement in the YouTube Comments Feed. While there have always been ways to share videos outside of YouTube, the ability for viewers to @tag their friends will foster greater in-stream conversation and allow brand content to spread organically within YouTube. Less “trolling” to worry about. We are hopeful that this change will bring about better-curated and less-offensive comments due to consumers practicing a new level of restraint to maintain their online reputation. And with higher-quality commenting, YouTube search results will be better optimized. Higher-quality interactions with YouTube commenters. Brands will now see a more relevant stream of comments from their most influential fans on YouTube. In addition, they will be able to provide better responses to those fans — now being able to easily respond with links, targeting legitimate questions or concerns, etc. Google is making a strong push to consolidate all Google properties via the Google+ platform. With the integration of Google+ and YouTube, brands now have an opportunity to get their YouTube content seen by an even larger Google+ audience. And as Google continues to make Google+ a core part of their ecosystem, more and more reasons for brands to pay attention to the platform will arise.